Even though about 60 miles separates the campuses of Michigan State University and the University of Michigan, there is nothing quite like the fierce and bitter rivalry that stands between these two revered institutions. The adrenaline and angst that builds up around the universities during rivalry in the week is the culmination of many years of sweet victories and bitter loses between each team. But being a member of either school’s marching band only elevates these emotions. Many have friends from past or present, and even some have family members in the opposing band as well, which is always cause for a little extra competition. 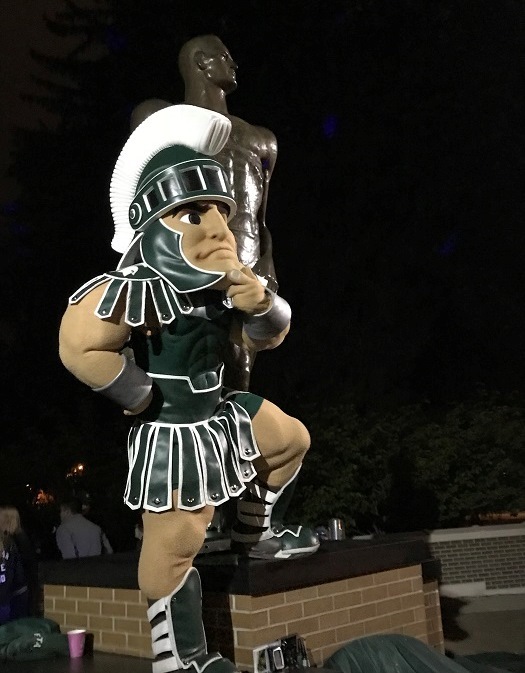 During that fateful week, many of our friends from the University of Michigan sneak over in the night and try to vandalize our beloved Spartan Statue. In response, members of the SMB and more recently, Spartan Super-fan “Johnny Spirit” hold a week long “Sparty Watch” event, to protect Sparty himself. Everyone involved has the same goal; to keep the famous Spartan statue safe, 24 hours a day all week long, until the end of the game. In the past, intruders have invaded enemy territory and done things like spray-paint Sparty maize and blue. Spartan fans have retaliated in similar ways, invading Ann Arbor and spray-painting the famed U-M Diag. In efforts to alleviate the vandalism tensions, Sparty Watch displays a new theme every night. Due to the fantastic relationship between the SMB and the football Team, Coach Mark Dantonio has made it a tradition to come by Sparty for a few pictures, while also bringing a few dozen boxes of pizza. While Sparty Watch is a few decades in the making, this long-standing rivalry is over 110 years old; and while there have been many memorable moments, perhaps the most recent was October 17th, 2015, a day forever engraved in the minds of Spartans and Wolverines alike. To set the stage, the seventh-ranked Spartans entered Michigan Stadium with a 6-0 record. The Wolverines, ranked 12th, were 5-1. The weather was suitable for a bitter, late fall afternoon, only ounces of sun trickled through the dense clouds. Two hours before the official kickoff time, the SMB marched The Series through the campus streets of UM and finished through the Michigan Stadium tunnel. The SMB took in the atmosphere and experience while watching the one of the largest stadiums in America fill to the brim. But before the ball could be kicked off, both bands had to perform their pregame shows. There is no best way to explain the feeling of performing your pregame show on the opponent’s home field. That feeling only escalates when it’s the Michigan vs. Michigan State game. Boo’s, chants, expletives, you name the negativity – it’s thrown your way as you enter the field and go through the motions. A certain type of adrenaline is burned inside every individual, adrenaline that makes your motor run, run like it’s never ran before. Your knees get up higher, your horn swings or upper body motions are snappier, and your playing feels invincible. What the SMB shares for halftime entertainment when they travel to Michigan Stadium has provided many memorable moments and highlights. Examples include the premiere of the Marvel superhero-themed show from 2015, a show that would be performed a total of five times throughout the season. The powerful Avengers theme song and depictions of the movie’s logo and a “STATE” spell out concluded that show, which would later be featured in publications such as Sports Illustrated and tweeted by Marvel actors and directors. In their latest visit to Michigan Stadium in 2017, the SMB put a little twist on an unforgettable halftime performance. 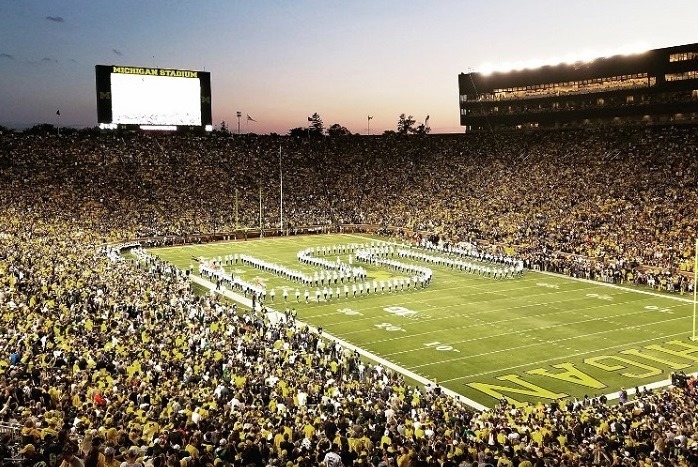 A “State of Michigan” theme was chosen, performed collectively by a combined 650+ musicians between both the Michigan Marching Band and the SMB. To our knowledge, nothing of this magnitude had been done before. The band(s) put on a spectacle, performing widely-known pieces, such as “Mars” from Gustav Holst’s, The Planets, In the Hall of the Mountain King and George Gershwin’s Rhapsody In Blue. 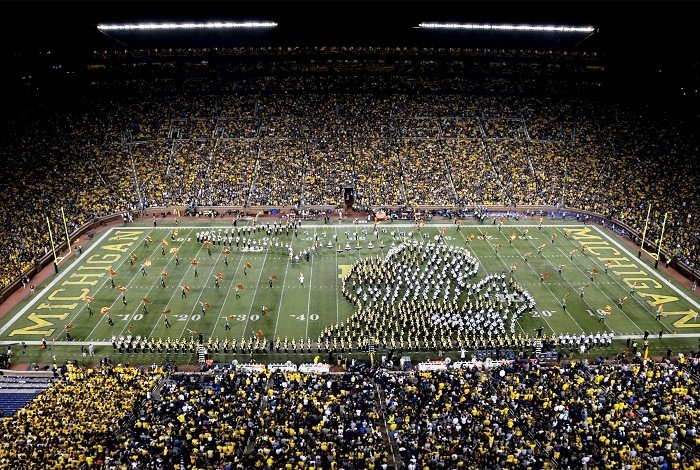 During the finale, featuring The 1812 Overture, the bands formed the geographical outline of the state of Michigan including the Upper and Lower Peninsulas. Weeks of hard work all came together during one two-hour rehearsal on the afternoon of the game, all for that 11-minute performance. Later that night and in the coming days, word and videos of the spectacle spread across social media. Those videos began to gain popularity and views, one even reaching to 1.5 million viewers in the span of a week. Both the 2015 and 2017 games and experiences included once-in-a-lifetime finishes for the SMB and all of Spartan Nation. “Whoa, he has trouble with the snap, and the ball is free! It’s picked up by Michigan State’s Jalen Watts-Jackson, and he scores on the last play of the game, unbelievable!” That now-famous call, voice crack as you will, from ESPN’s Sean McDonough perfectly portrays how the 2015 game ended. The Spartans snatched the win from the Wolverines’ jaws of victory in the last ten seconds of that game, winning 27-23. After a couple minutes of complete pandemonium and euphoria for everyone in green and white, the SMB had to regroup to play a loud and exhilarating rendition of “Victory for MSU.” The 2017 ending was much the same, coming down to the final play. An incomplete Hail Mary pass ended Michigan’s hopes at ultimate karma as Michigan State upset the seventh-ranked Wolverines, 14-10. To honor a long day filled with sweat, lots of rain and fast-beating hearts, the SMB had the privilege of celebrating on the field with the Spartan players and the freshly-retained Paul Bunyan Trophy before lining up for the postgame performance. Not many universities can say they have a stronger bond between their football program and their band. There’s just something special about being a Spartan.